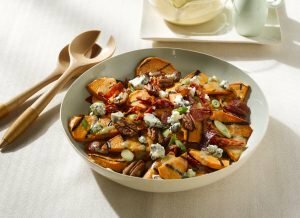 Tossed with hot bacon dressing, tangy blue cheese and crunchy pecans, this Sweet Potato Salad is a classic dish with a savory twist! Taking your taste buds from sweet to tangy to creamy, everyone will beg for seconds, and thirds! Enjoy this tasty sweet potato salad as a side to your favorite barbecue ribs, with a deli sandwich or plated next to a piece of juicy, roasted chicken. To make the dressing: Preheat oven to 200°F. In a skillet, cook bacon until crispy; drain and reserve grease. Crumble bacon and set aside. In a small bowl, whisk together vinegar and mustard; slowly whisk in olive oil and 1 tablespoons of the reserved bacon grease until dressing is emulsified. Season with salt and pepper. Keep warm in oven. Using a brush, lightly coat sweet potatoes with olive oil. Put the potatoes in a resealable plastic bag, add the oil and massage to coat all surfaces. Grilling Instructions: Just before putting on the grill, season sweet potatoes liberally with salt. Place rounds directly on the cooking grate over direct heat; grill until well-marked, about 3 minutes on each side. Move to indirect heat. Finish cooking, turning halfway through, until soft and tender, 20-30 minutes. Remove from grill. Immediately cut into quarters and remove to a large bowl. Grilling Alternative: Preheat oven to 400°F. On a rack fitted into a baking sheet, place sweet potato rounds and season well with salt. Bake until tender and browned around the edges, about 30 minutes. Immediately cut into quarters and remove to a large bowl. 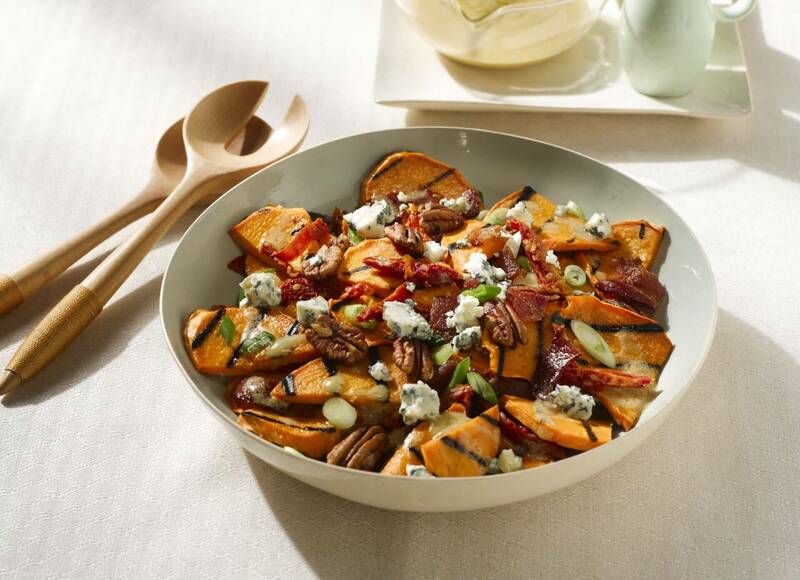 To make the salad: To sweet potatoes, add 2 tablespoons of the dressing; toss until just coasted. Add reserved bacon, scallions, sundried tomatoes, pecans and blue cheese. Drizzle a little more dressing and toss to coat. Season to taste. Serve immediately or at room temperature.